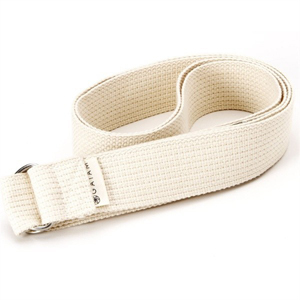 Experience the mind-body satisfaction of flexing beyond your usual limits with a strap made of 100% cotton. This extending strap allows you to expand your range, achieve more challenging positions and sustain poses for longer periods of time while deepening your stretches and extending your reach while allowing your shoulders to relax. The easy-release cinch buckle holds the strap securely in place. Experience the mind-body satisfaction of flexing beyond your usual limits. This extending strap allows you to expand your range, achieve more challenging positions and sustain poses for longer periods of time.